but haven't put it together into an actual pillow yet. 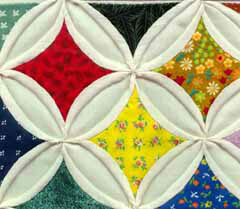 It is a fun pattern, and a good way to use colorful scraps. 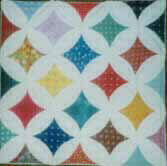 I also liked it because it travelled easily, and satisfied my love of "hand-stitching". I sewed together the starting "boxes" by machine to save time. Then the rest was done by hand. Hardest part? Making the corner connecting stitches neat!